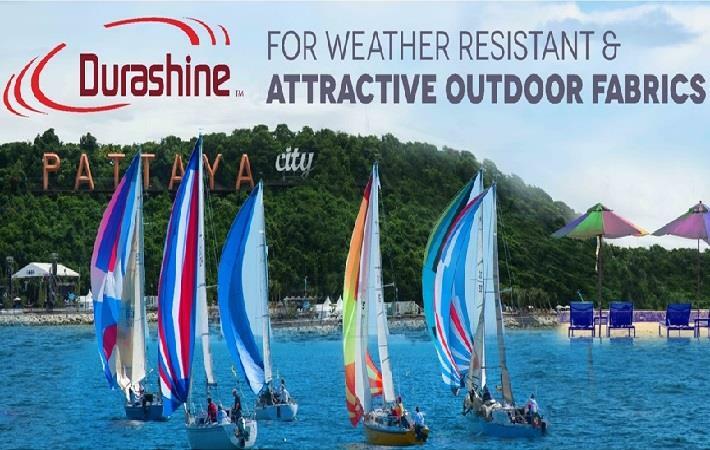 Thai Acrylic Fibre Company Ltd (TAF) is going to promote Durashine fibres at the Ocean Marina Pattaya Boat & Yacht show 2018 to be held at Pattaya Marina from November 29 to December 2. Durashine is produced with highly advanced solution dyeing technology which makes it permanent weather resistant and ensures unmatched durability of more than 5 years. Durashine protects the fabrics from sunlight/UV rays, heat, heavy rain, and saltwater/chemical/mechanical weathering. TAF with his Durashine Select Partner Bulliontex & Rovitex has developed a wide-range of outdoor fabrics from its solution dyed acrylic fibre Durashine. The premium fabrics are used in all types of under-the-sun applications like awnings, garden umbrella, outdoor furnishings, and also marine/boat exterior/decorative/sail fabrics. Durashine Select Partners will assure that the end consumers get all of Durashine’s brand promise and best value of their investment.